Voted twice as World’s Leading Thalasso & Spa Resort (World Travel Awards) and listed among the 5 top Overseas Spa Retreats (Condé Nast Traveller- Readers’ Spa Awards) the Royal Mare Thalasso seduces with its size, luminosity and serenity whilst is offering a unique experience in well-being, relaxation and beauty. The centre is situated in the luxurious surroundings of the hotel, Aldemar Royal Mare Village *****, on the northern coast of Crete, 23 km from the Heraklion International Airport, 25 km from the city of Heraklion. An area of 4000 s.q. Fully equipped with modern and luxurious installations: AquaRoyal® the master hydromassage pool (350 s.q); Aquagym; Aquastream; Beauty centre that includes 11 individual beauty care cabins, exclusive massage area ‘ZEN’, Fitness centre, squash courts, Hammam, sauna, and natural solarium, to name but a few. A highly qualified team of 65 experts embracing the guest with their expertise and friendly care during their every moment spent here. More than 65 à la carte treatments. 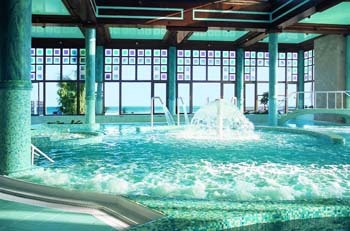 More than 15 Thalasso programmes, ranging from wellness to intensive weight loss to circulatory and vertebral improvement. 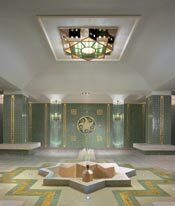 The unique ritual of Hamam Oriental. Massages from all over the world. ...all supervised under the expert eyes of the center’s impressive team of nutritionists, physiotherapists, hydrotherapists, masseurs, beauticians and fitness instructor.